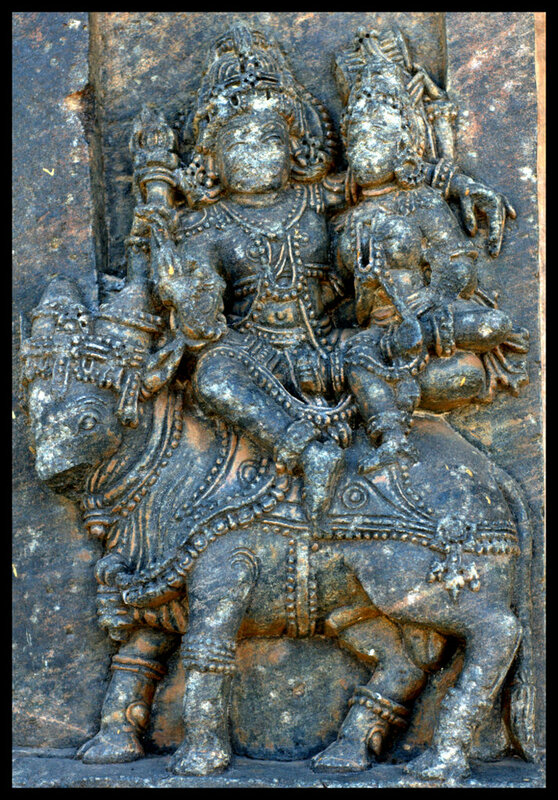 Koravangala is 10km from Hassan. 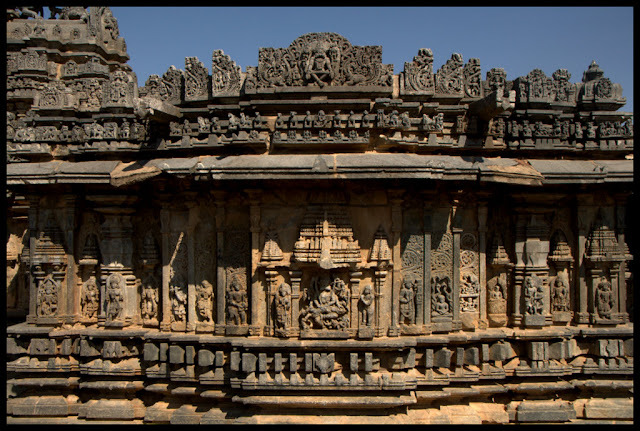 The Bucesvara-temple found here is a handsome monument; it elegantly shows the characteristics of Hoysala architecture and Sculpture. 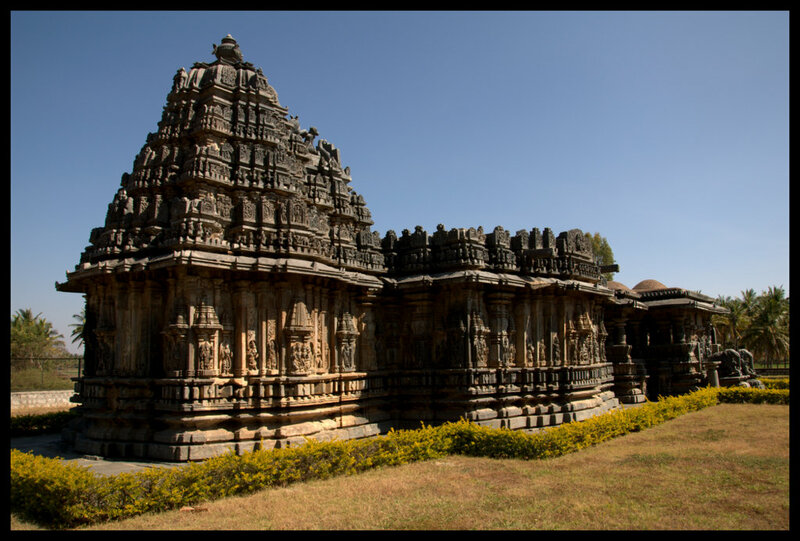 The temple has been build in 1173 AD by a rich officer called Buci and is well preserved. There is a neat fence around it, and pavement and lawns, and it is guarded well. To its north, the fascinating ruins of two other temples can be found. (One is directly seen from this main temple). The plan of the Bucesvara-temple is simple and elegant, it is a divikuta with the two shrines facing each other. 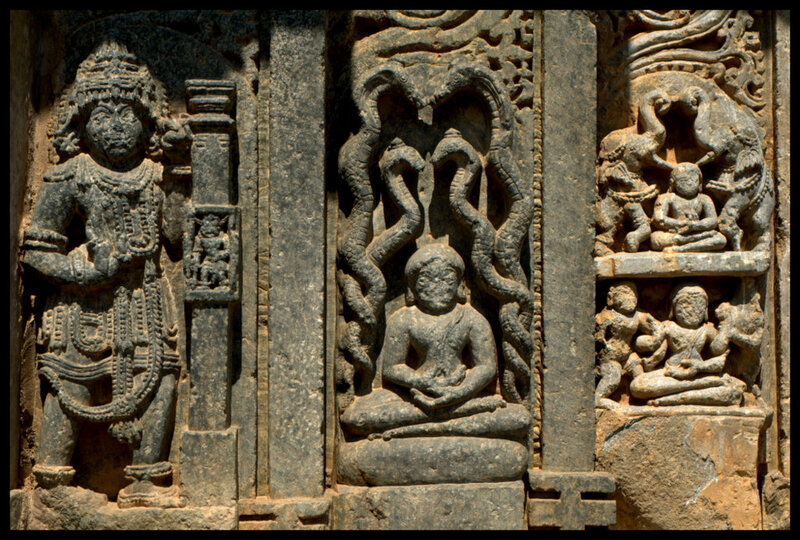 These shrines are connected by a succession of a closed hall and open hall, thus presenting one of the cellas in the mysterious darkness of a closed hall, and the other in the dim light of an open hall. 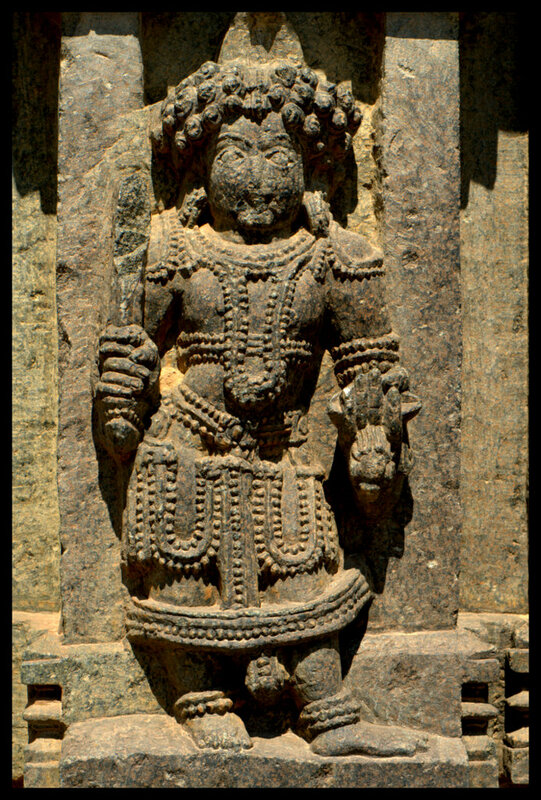 At the eastern end of the very oblong building, facing the south, there is a separate Bhairava Shrine. The western shrine facing the east is complete in every respect, and is a very fine example of a shrine of the old kind. It is of a simple plan, square with three projections per side. 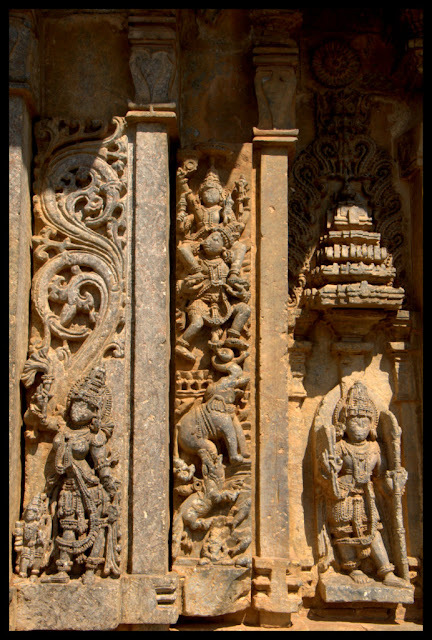 Kalasa and Hoysala crest are present, and all architectural parts of the tower and the walls are decorated in the conventional way. Both the halls are next to each other. The closed hall is complete , the open hall is not because there is nothing above the eaves is present. The open hall provides the temple with two side entrances; both of them are framed, and the southern entrance is flanked by tow small elephants. Of the interior, that of the open hall is the most enjoyable; it has fine ceilings and wonderful flossy pillars. 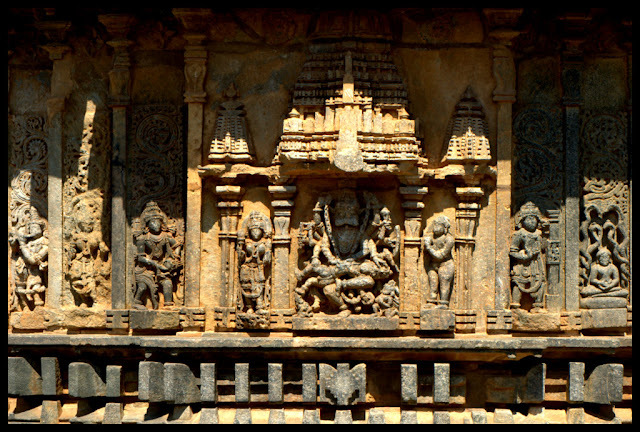 The cella facing east contains a linga; the cella facing west, with its vestibule directly connected to the open hall, has a cult-image of Surya. We were lucky that we could find the official guide on the day we visited the temple. 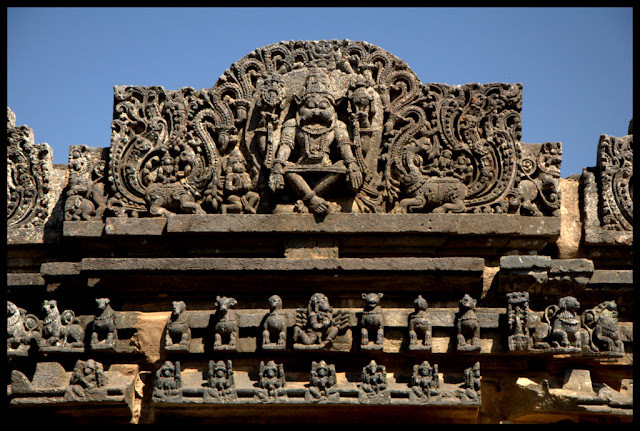 Mr. Venkataramaiah H. N is the official District Tourist Guide. He is a resident of Koravangala and a very knowledgeable person. He explained (both in English and Kannada) a lot of stores to us and helped us understanding more about the Hoysala Architecture. He can be reached on this number: 995-555-3922 anytime. I have taken some of the text from the book "A Complete Guide to Hoysala Temples" by Gerard Foekema. Photographed on 2012 January 26, Thursday. Beautiful photos with apt summary! These are incredibly beautiful photographs. You have captured the aesthetic essence in all its splendour. The details with the proper light and shade effect do justice to the sculptors (shilpins). The text provides the proper context. Thank you for evoking the visual feast long after the visual memory of witnessing them fades into the deeper recesses of our minds.